Hans Florine knows speed. 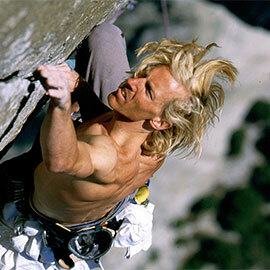 He is a professional climber, speaker, author and thought leader in speed and efficiency. Florine has repeatedly set and broken one of the most coveted speed records in the world: The Nose of El Capitan, a 2,900-foot monolith in Yosemite Valley. In 2012, Florine, alongside his climbing partner Alex Honnold, took the record again in 2 hours and 23 minutes, lowering the previous record by a full 13 minutes. He also holds numerous speed records in Yosemite National Park and all over the globe. Florine won the first International Speed Climbing Championships in 1991 and has held the U.S. National title eleven times. He won gold at the ESPN X-Games three years in a row. He is the author of “Speed is Power,” an audio program full of ideas, examples, and tools to utilize the fundamentals of speed in business and life, co-author of “Speed Climbing,” now in its second edition and producer of the award-winning documentary, “Wall Rats.” He has been featured in San Francisco Chronicle, Sports Illustrated, The New York Times, Men’s Journal, Fitness Runner, Rock and Ice Magazine, Climbing Magazine, Alpinist, Diablo Magazine, Master Athlete, and more. Florine is an athlete/ambassador for Outdoor Research, KineSYS, Honey Stinger and NUUN. He is an ambassador for The Access Fund, an active member of The American Alpine Club and supporting member of the Yosemite Fund, Leave No Trace, South Yuba River Citizens League (SYRCL). Florine earned his business degree from Cal Poly San Luis Obispo, specializing in production operations management and human resource management. He has been certified in production and inventory management (CPIM) from The American Production and Inventory Control Society (APICS). Florine has continued his education with tax accounting certification, USGBC LEED Green Associate certification, Dale Carnegie Leadership training and with speaking and success trainers.